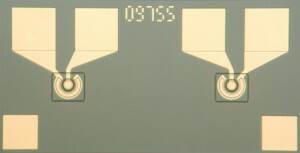 Twin array of balanced, ultra high-speed InGaAs/InP photodiodes with separate anode and cathode pads in a Ground-Signal-Signal-Ground arrangement. Each channel is optimized for data rates of 28 Gb/s. 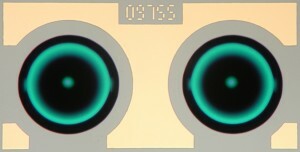 The 15 mil (381 μm) pitch between individual photodiodes is a common waveguide pitch.